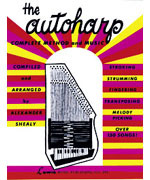 The Autoharp Owner's Manual covers autoharp maintenance, conversions, tuning and string schedules (both diatonic and chromatic), building your own instrument, playing techniques, evaluating instruments, chord bar setups, amplification, history, and much more. A step-by-step learning guide to the autoharp. One of the most beautiful (and easiest) traditional instruments. Includes detailed instruction on holding it, proper use of the chord buttons, strumming and fingerpicking techniques and how to pick out melodies and play instrumentals in the styles of the great traditional players. Download now from PlayBetterBluegrass.com!